Is La Nina cooling San Diego’s weather? Today will likely become the hottest day of 2010 so far as high pressure builds from the Lower Mississippi valley westward, dominating Mississippi to west-central Texas, 100s likely will stretch from the north Houston suburbs to southern Kansas today under brilliantly sunny skies. I am looking for highs to push or even surpass 105 degrees today in portions of east-central Texas. Dallas may top out this afternoon at around 103, Houston 98 and in between I’m looking for a 105. Tomorrow may be even warmer! As for areas surrounding Houston down to Galveston, look for the hottest surface temperatures to be where there has been less rainfall recently. Areas north of Downtown Houston will likely see 4-6 degrees higher than south of the Houston. Whilst Houston will likely aim for 98 or 99, it will likely be muggier close to the 88-degree waters along Galveston beach where air temps will push 94-95 but dew points that are in the middle 70s will make it feel over 110. Brownsville will top 95, San Antonio 98, Lubbock 95 and Amarillo will top near 98. Oklahoma City will likely warm to around 101-102. Tonight look for lows dropping to the mid-70s in most places, nearer 80 along the muggier coast. 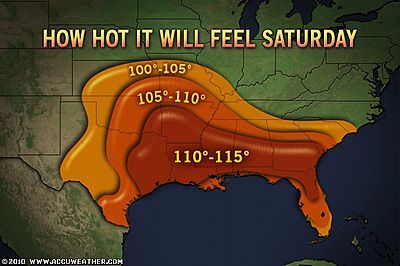 Another very hot day and very hot and humid the further south and closer to the Gulf or Atlantic waters you go today! 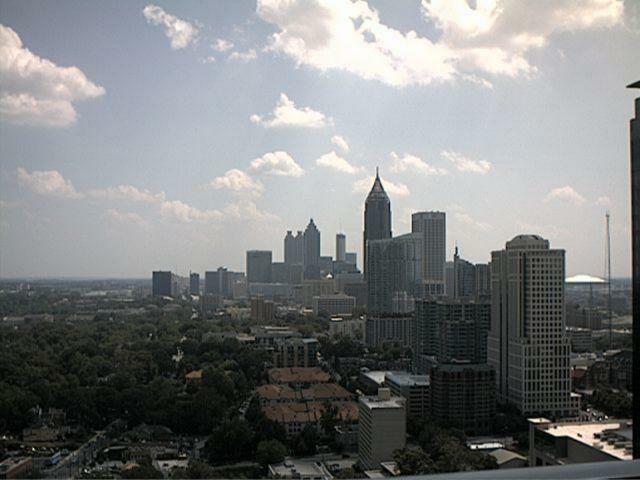 The heat will be peeled back slightly in eastern areas of the region from say Alabama into Georgia and south into Florida. This is because the high pressure cell providing such stable, sunny and very hot weather has shifted slightly west, meaning a 2-4 degree drop over Alabama, Georgia, Florida and up into the Carolinas, whilst a rise of 2-4 or more degrees for Mississippi, Louisiana into all of Texas where the worst air temperatures will be seen. A frontal boundary is drapped over north Georgia, Alabama, helping lower highs and increase a thunderstorm chance for places like Atlanta & Charlotte where highs may top around 93-95, humidity levels will also be relatively low (60s), therefore, though it may feel close to 100, it’s not going to feel like south Alabama and Georgia which will endure mid-90s and mid-70 degree dew points, making it feel like 110 or higher. 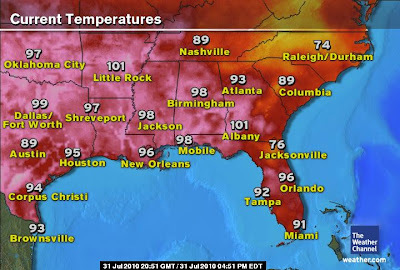 Where it’s going to be downright dangerous this afternoon and basically by noon will be Birmingham, Alabama, Jackson, down to Biloxi, Mississippi, New Orleans, Louisiana north and west where highs will run between 96-101, dew points in the 70s will make even downtown New Orleans feel possibily close to 115. 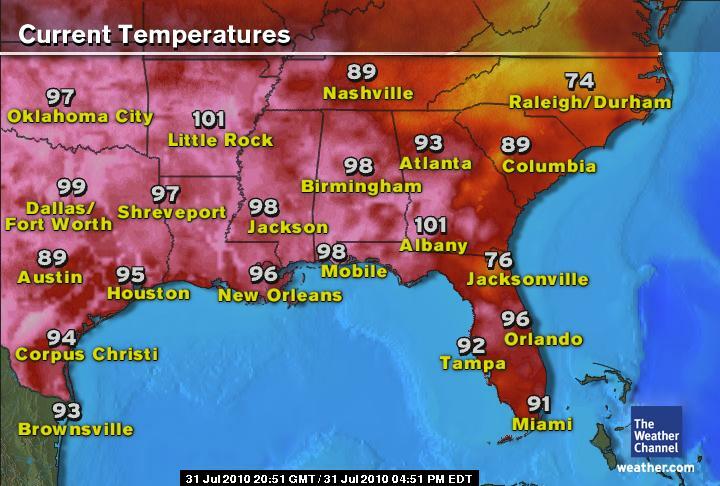 Near the super warm Gulf and bay and inlet waters where upper 70-degree dew points bubble in mid-90s, it may make spots like Biloxi, MS, Bootheville, LA and other steamy, swampy places feel more like 120 in spots! Lows tonight range from the mid-70s across the board to low 80s near the coast. 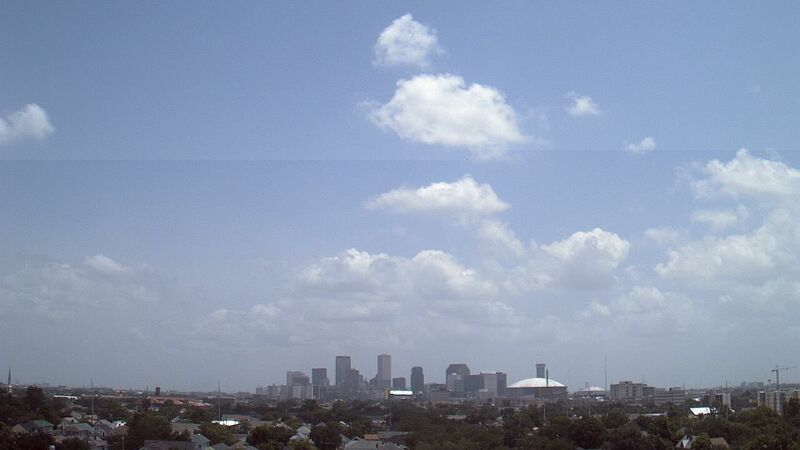 Bootheville and Venice, LA may stay as warm as 85 for the low! Across Florida there will be a chance of sea breezes storms this afternoon, particularly central and south Florida, whilst drier, hotter air will keep upper 90s to around 102 degree temps in north Florida where the atmosphere is more capped.. Lows tonight range from mid-70s inland to 80-85 along the coast! A relatively quiet day for the Northern Plains and Midwest with sunshine and highs in the low 90s for the Dakotas, 86 and sun for Minneapolis, 84 for Chicago. 90-94 from Kansas City to St Louis. Lows will be genrally in the 60s in the Dakotas and down into Minnesota, Iowa, Illinois and Missouri. Urban areas will likely remain above 70. An absolutely perfect day for the beach or even a day to spend doing some yardwork across the entire Northeast as humidity is comfortable and so too are the temperatures. You couldn’t ask for better for the final day of July 2010, particularily after the heat and humidity seen in this region of the country. Look for abundant sunshine wherever you are today. High will top 85 in Washington DC, 84 in Baltimore and Philadelphia, 82 in New York and a perfect 78 in Boston. If your heading for the Jersey to Lond Island beaches, look for 70s with a cooling breeze, Further north, you may actually feel a slight chill along the beaches of Rhode Island, Massachussetts, New Hampshire and Maine where it may stay in the upper 60s! .. Lows tonight will fall to the refreshing 60s, even downtown areas of the big cities. Widespread 50s, yes 50s for surrounding rural areas. Are we looking for 40s and even 30s across the mountain valleys of New England? YES! Thank a nice, dry Canadian origin high! Refreshing at the coast (highs in the 60s with morniong fog) mid-70s for Seattle, low 80s for Portland, 60s in the mountains with a chance of an isolated light shower, hot for areas east of the mtns where highs are likely to yet again push into the mid-90s to near 100! Further south and east, Boise will enjoy a hot afternono with a high around 98, Salt Lake a sunny and hot 91 whilst a chance of a monsoonal storm will spoil the show in Denver with a high around 89. Montana will see 80s to mid-90s with Billings aiming for 94. Lows tonight will see widespread 50s with 30s and 40s in the mountains, 50s and 60s in valleys of the entire region. The marine layer has thickened somewhat again today as a trough weakens the ridge somewhat over the Four Corners, this will aid in bringing low stratus and fog onshore this morning but will burn off bringing highs towards the 70-degree mark along the S. Calif beaches, upper 60s for central and northern Calif beaches. Downtown San Diego and LA should see burn off times around 10-11am, eastern suburbs earlier than that. San Francisco may see burn off restricted to early or mid-afternoon. Look for highs in San Diego and LA of 76 degrees, 70 for San Francisco. Coastal Valleys and canyons should warm to around 85-90, low 90s for Riverside. The Central Valley should warm to the mid-90s today. As for the deserts, Death Valley will as always be the hot spot with a high around 118-119 like has been the case of late, around 103-105 in Palm Springs, Baker and Las Vegas, 100 for Barstow. Phoenix may see a higher t-storm chance today and therefore it may actually fail to top 100, perhaps only to 98-99. However if skies remains fairly clear despite high dew points, it may top into the low 100s. Lows tonight range from the 50s at the beach, 60s for the downtowns and coastal valleys and canyons, 70s for the desert, mid-80s for Vegas and Phoenix. The current low, now over west M.P./Gujarat at 998 mb, is maintaining its precipitation strenght. With Good rainfall along its path, and good capacity to attract cloud mass from the Arabian Sea, it has generously drenched Central India, Maharashtra coast, and many pockets of Gujarat too. A vortex (see map) in the north Arabian sea has suddenly increased precipitation along the north maharashtra coast (MUmbai) on Friday.Vortex expected to merge with the incoming system. Keeping up the trend, like the previous low, this system should wipe out the “red” region totally. Well, as a reader has asked,, could it now track SW ? Difficult ! My estimate is that a weakening system should move, along the axis, west-northwest, into Rajasthan. Precipitation will also shift from M.P. to Konkan,Gujarat and South Rajasthan from Saturday. At this rate, Konkan and Gujarat should be piling up in surplus. More Rains for this weekend (Saturday thru Monday) in South Rajasthan, Gujarat, especially coastal Gujarat and Konkan getting very heavy falls on Sunday (upto 150 mms in pockets) in 24 hrs,and then the wet patch rolling into Sindh coast from Tuesday. Standing out prominently is the rainfall at Dehra Dun. 364 mms in 24 hrs eneded Saturday morning. Another noteworthy reading, Bareilly, 75 mms. 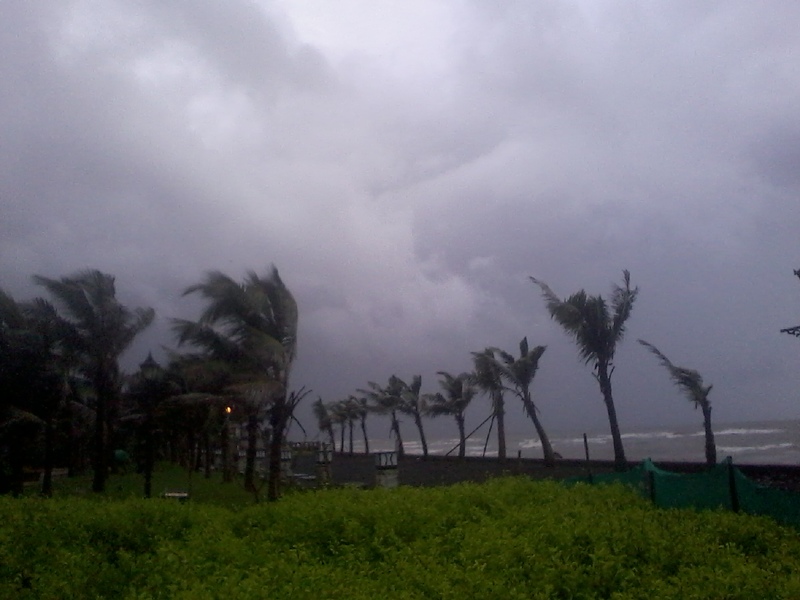 Reason: Yesterday, another cyclonic circulation extending upto 3.1 kms a.s.l. was over west Uttar Pradesh and adjoining Uttarakhand. Interacting with western disturbance as an UAC in the same altitude, there was an instant formation of high clouds (rain bearing) in the region, as a cold front was locally created. 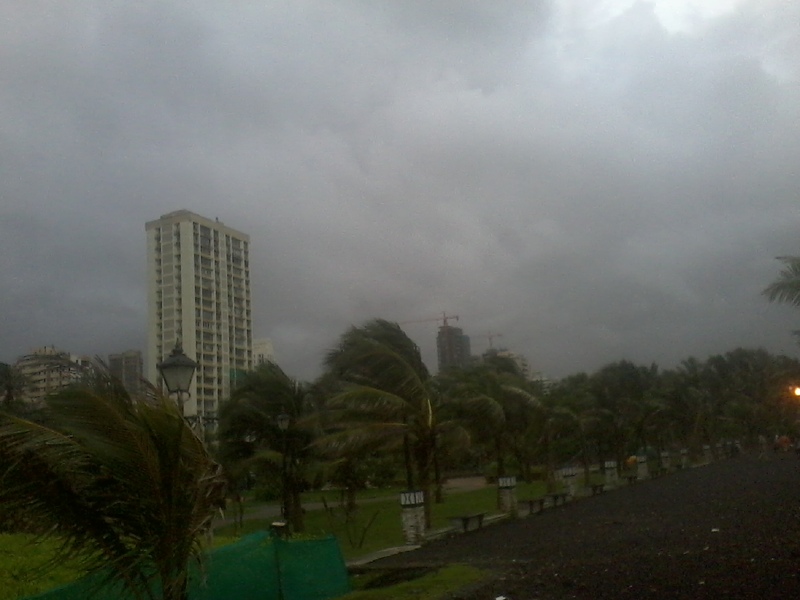 Mumbai: With the help of a 3 hour drenching on Saturday morning, Mumbai Colaba season’s total has overshot the 2000 mms mark, and stands at 2046 mms as on Saturday morning. The 3 hour downpour overshot my forecast of 30 mms for saturday by 24 mms. Saturday and Sunday will also be wet, as per the analysis above. Would not hesitate to expect 150 mms Saturday thru Sunday. Very frequent rains during daytime Some extremely heavy falls could flood low areas. Rain intensity tapering a bit by sunday evening. Monday:expect frequent showers to continue, but with 40 mms of rain that day. And not a soul is going to crib in Mumbai ! The combined lakes are now at a storage level of 6.7 lmlitres, against a full capacity of 13 lmlitres. 51.5 % full up.